Listen up you out-of area people- it could spread to you! I have been reading the new ordinance, scrambling to get my paperwork in order. Ordinance 17-33, the first of its kind, dubbed the "Truth-in-Training" act was passed on 15 November 2017 at the Hillsborough County Commissioner's office. They did not put it to a public vote. The whole scene was a fiasco, and we will not get into the details here, but a lot of voters are unhappy with the flagrant ignoring of the public's wishes in this case. Apparently the Commissioner's office think this is going to "put Tampa on the map." It already is on a map since around 1823...check google.... After passing the ordinance, the County Commissioners went into hiding, refusing to answer emails and phone calls requesting details on the matter. 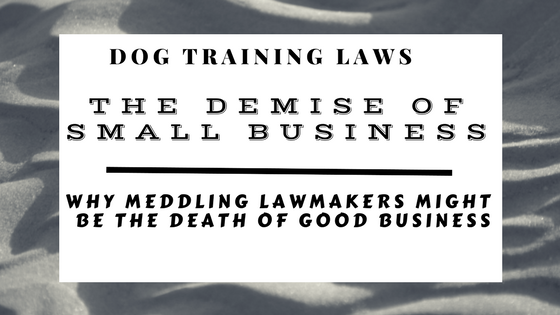 I'm a law-abiding citizen with all the credentials and insurance necessary to conduct a dog training business- why on earth would they not want to help me and my upstanding business comply with this new (tyrannical) legislation? Because basically it's written like a cheesy play with dog trainers as the bad guy and dog owners as swooning (somewhat childlike and not very intelligent) damsels in distress. I guess the Commissioner's Office is the hero in this entirely inconvenient and insulting play? Some hero....they're hiding under a rock somewhere hoping the voting public does not remember this blatant disregard of public opinion come election day. I assure you I will remind as many people as I can. This is going to be the first in a series of posts. I will write an update on my experiences accomplishing compliance with the law, will talk about the writing of the paperwork, and how the law changed my business over time. 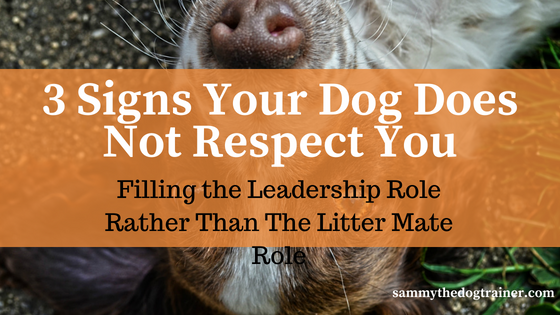 I will share my paperwork upon request to any dog trainers that need help. This is for a future post. 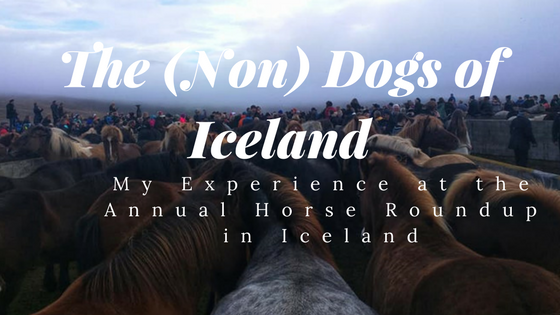 This post is about my first impressions of this new ordinance. I may change my opinion throughout the process of complying with the law. I am not so immutable in my opinions that they cannot be changed with reason and logic. 1. There are 29 professions requiring license in the State of Florida. These include veterinarians and asbestos handling contractors....apparently 30 is dog trainers although they have yet to actually put any information or establish any avenues online for dog trainers to apply for anything or learn anything other than posting the Ordinance and then creeping back under their proverbial rocks. 2. Massive paperwork! 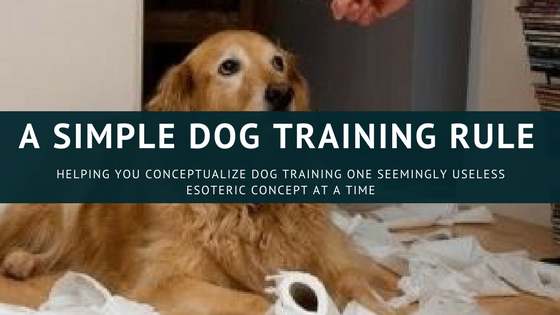 Every single client is required to have a written training plan, signed by both parties and a Dog Training Services Consumer Acknowledgement Form. The acknowledgement form, at least, was provided as an addendum to the ordinance. It holds the owner's hand while it walks you through every point, making sure the owner understands that the dog trainer is some devious and potentially harmful agent, not someone you hired to help you with your dog chewing on your shoes. Do you feel insulted? You should, dog owners! This law acts like you cannot so much as tie your own shoes! 3. Invest in carbon copy papers....yay more additional expense! Because you cannot begin training until all this crap is briefed, signed, and the owner is provided with a copy of said massive paperwork. Therefore you cannot start the lesson until a copy of the completed paperwork is provided to your client. My first meeting with my clients is their first lesson. If they hate me, they do not have to schedule another lesson. That is why I run my business that way- it's a free, fair market concept. So the only way I can think of to do this is to buy carbon copy paper...and waste the better part of my clients' first lesson fee on this paperwork monster. Sorry guys. 3. All this paperwork has to be filed with the county on the 15th of every month....yikes Big Brother. There are so many paranoid angles I could take on this. Invest in carbon copy paper with multiple levels of pages and pray they actually work. 4. The dog training business has to keep all these copies FOR 4 YEARS....more investments...either a ton of filing cabinets (not going to be cute in my little cottage) or a way better scanner than the one I have. 5. Expenses, expenses, expenses. The fees, at first perusing seem to be absent from the established ordinance that were in the draft- I could be wrong. The fees might be in the ordinance somewhere that I have not picked up yet. But the draft having a clearly denoted 50 dollar fee for a 24 month license and the law only stating the 24 month period makes my paranoid mind think...they are raising the rates and will continue to do so whenever the fancy strikes them. 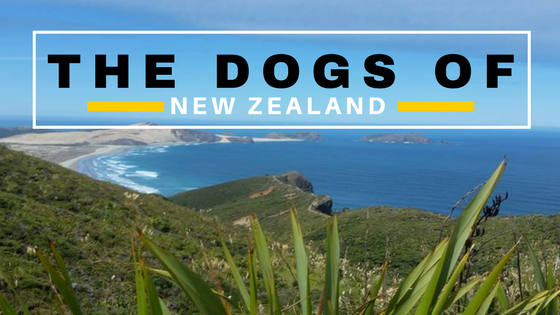 Not only is there a fee to be a dog trainer, but there is another SEPARATE FEE, to own a dog training business. Small business, this is you getting the proverbial bird. I'm sure the city will stick its finger in the dog training pot too somehow. 6. I feel like a criminal reading the gigantic section on penalties. In the county's wisdom (?) they have manufactured a whole new punitive board to oversee the evil dog trainers. I guess the animal abuse laws in place were not enough? I'm not a lawyer, but you would think if a dog trainer, or anyone else for that matter, was abusing animals, they would be cited or charged through the laws already there. It's not perfect, obviously with the animal abuse that does go on, but why not improve those laws and enforce them more? Nah...who doesn't enjoy adding to Big Brother?? Let's make a board and all the legal trappings that go with it! 7. Here's a paranoid thought for you: I already have all the insurance you could want for my business....but now people KNOW all dog trainers have it. 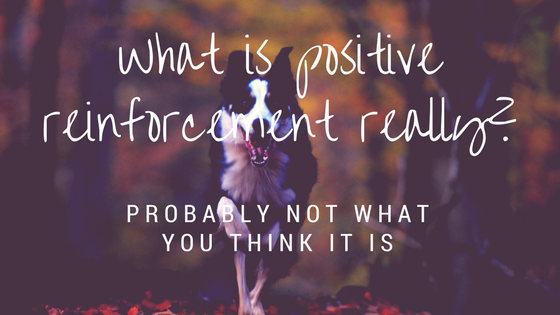 Just watch the onslaught of unscrupulous law suits commence because now there is a fancy new punitive board raring to plaster its first "evil" dog trainer poster child on its wall. Guess what the city gets if it does find a dog trainer "guilty" of transgressions? You guessed it- loads of money in the form of fines. I might be out of place positing this thought but...is that not an incentive to find dog trainers guilty of charges when they are not? How dare I suggest such a thought! 8. Horse trainers....where is the ordinance for them? Or monkey trainers? Or....yeah you get this idea. I guess athletic trainers need a license so maybe we should be flattered? The county thinks our dogs are athletes....yay. 9. The application to obtain a dog trainer license is humongous. You have to wax poetic about your entire life experience, credentials, schools etc. I have filled out less in depth college applications. While I have above and beyond the credentials needed, in the back of my mind there is always the worry that some uneducated government paper-pusher somewhere is going to look at my application and in the heat of an illogical bureaucratic fury, deny my application because they cannot read big words or haven't had enough coffee that day or hate life because they work in a giant bureaucracy (I am sympathetic to the last two plights). 10. 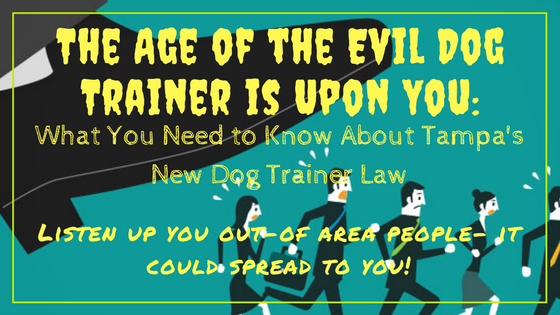 The law was advertised to protect dog owners from evil dog trainers. However, many people have the misconception that it will protect your dog at doggy daycare or at boarding. 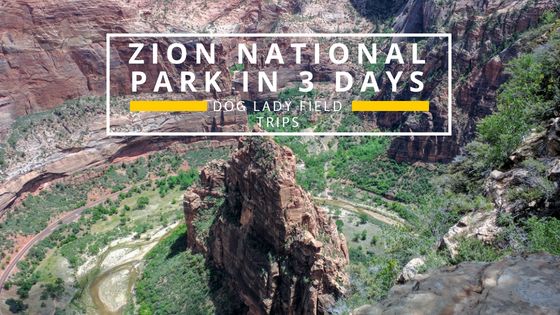 These places need to have separate insurance to cover your pooch and you need to make sure they do (Camp Sammy fans, I have really good insurance). This law only applies to training. If you dog is just enjoying a day at daycare....he's not covered by it. Really at the end of the day the law is just to punish after the fact anyway. If you want to prevent damage to your dog, then do your homework ahead of time. 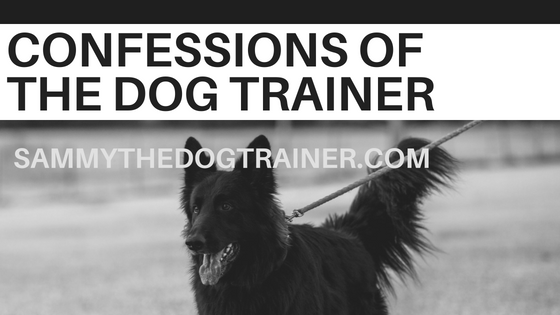 See my article on selecting a private dog trainer: Selecting a Private Dog Trainer The basic gist of it is: hire someone you like and feel comfortable with, and do not hire a toothless meth addict. I can foresee a lot of dog trainers raising rates and refusing a lot more cases than before. The challenging aggression cases are going to be passed over due to liability and those dogs will get euthanized eventually. The average family will start to struggle to afford dog training. The ones that can afford it might be denied anyway depending on the severity of their case (because they can afford lawyers and lawsuits and all the fun stuff that go along with doing business with an insured company, or because their dog requires a firmer hand than trainers are willing to risk in this environment). I find the slow, patronizing take over of the government in your life decisions to be worrisome. If I were a dog owner looking for a dog trainer, I'd be insulted by this law. It clearly asserts that you have no logical faculties to be able to make responsible decisions for yourself. Like I said, this is the first in a series of articles. I will keep you posted as I navigate this fun, unique problem set. Perhaps at the end of it all, I will be a huge supporter of the Truth-in-Training extravaganza. Who knows?